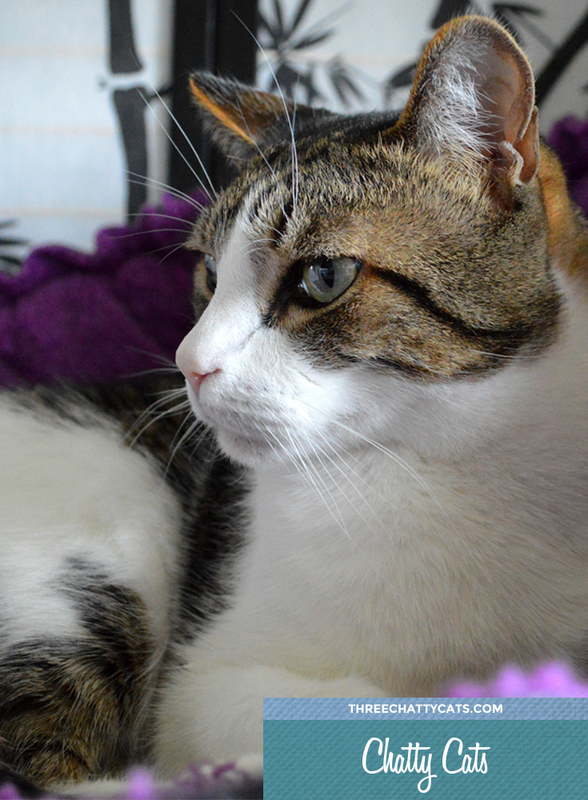 Chatty Cats: Pawsies, Awkward and More! Happy Friday! Anyone watching the big Bowl this weekend? And by that, you know I mean the Kitten Bowl, right? We’re not a sports family over here, but I’ve heard that one of the local teams is playing (the Los Angeles Rams). So, I imagine I’ll be hearing lots of whoops and hollers from the neighbors. Whichever Bowl you decide to watch (or not watch), I hope you have a wonderful weekend! Here’s what the cats were chatting about this week! Harley: Mama, some big cat is following me around! Mama: That’s you, Harley. It’s your shadow. Harley: But I’m so floofy! Mama: Yep, you’re quite floofy. Harley: My mind is blown, Mama. I knew I was awesome, but this could be too much awesome for one cat! Avert your eyes, Mama. Who knows what this much floofy awesomeness will do to mere humans. Mama: Quick! Whose pawsies are these? Hint, it’s not Olive or Harley. That leaves Dexter, Sophie or Woodrow! Woodrow: Mama, do I have girlie pawsies? Mama: I’m not sure there’s such a thing, but why do you ask? Woodrow: Because yesterday so many people thought my pawsies were Sophie’s! Are my paws too small? Have I lapsed in my grooming? Do they look like her dirty toes? Mama: Some thought they were Dexter’s paws. Woodrow: Ugh! I don’t even want to go there. Mama: Don’t worry, Woodrow. 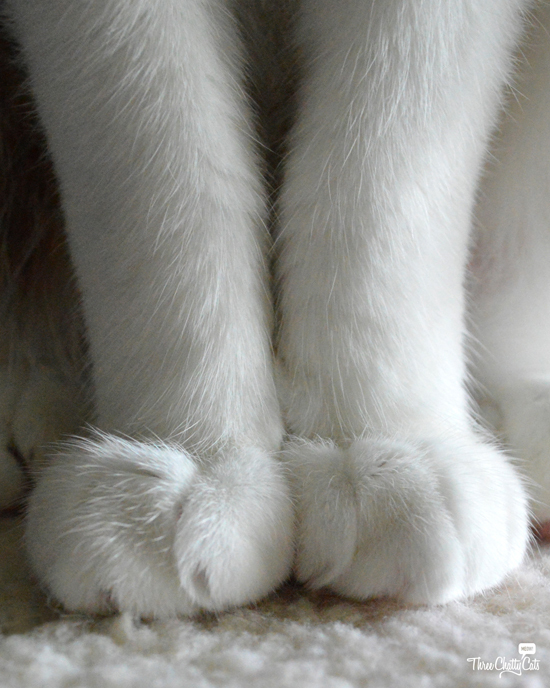 Your paws are perfect just like you are. At the time of revealing Woodrow’s paws, the guessing breakdown was 53% Sophie, 27% Dexter and 19% Woodrow. Woodrow is happy that his grandma guessed correctly. Or else he’d never sit on her lap again! 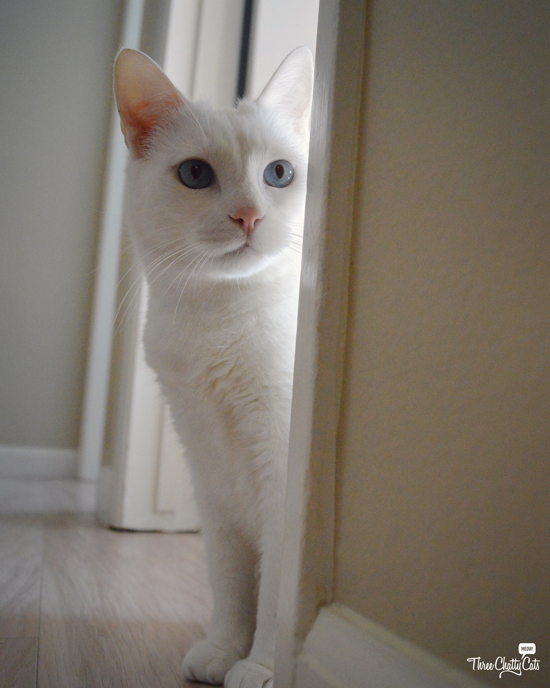 Sophie: Mama, may I please come out of my room now? Mama: Are you going to pounce on Olive again? Sophie: Only when you’re not looking. Mama: What are you doing on my towels, Olive? Olive: I’m keeping them warm for you, Mama. Don’t you like a warm towel after your shower? Mama: I’d prefer a non-furry towel. Olive: Well, I can’t help you there. I’m only a towel warmer, not a de-furrer. That’s asking too much of me, Mama. 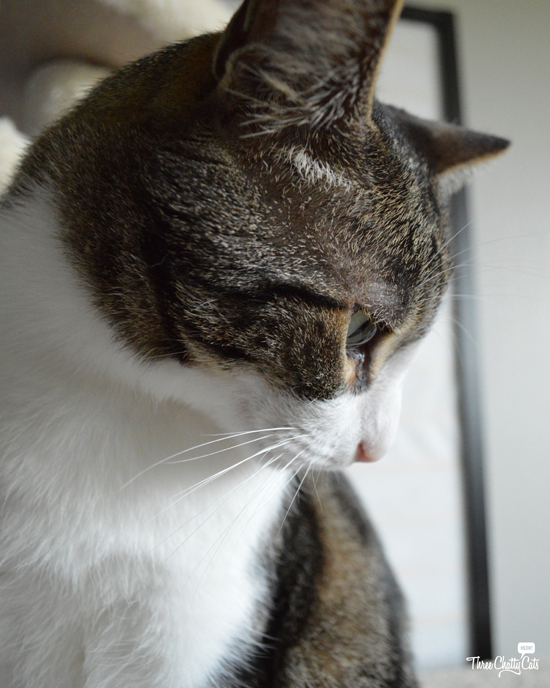 Mama: Want to take a Whisker Wednesday shot? Mama: You’re so awkward, Dexter. 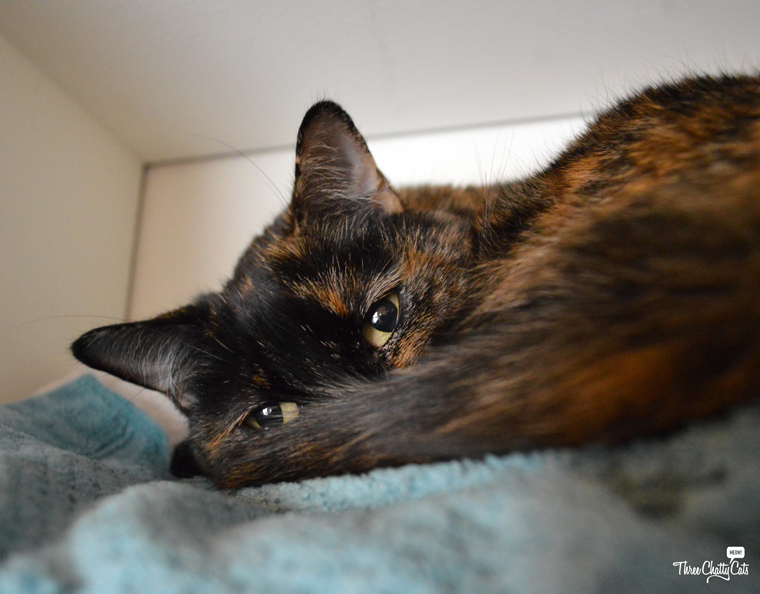 Sophie: Rainy days are perfect for cuddles and hugs. Mama: Do I get a hug, too? 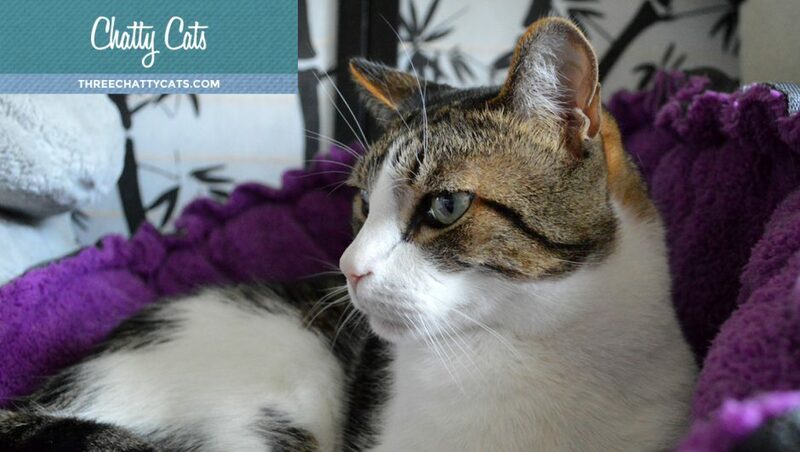 Sophie: Rainy days are perfect for cuddles and hugs between cats. Dexter: I would give you a hug, Mama, but Sophie said no. Mama: And you always listen to Sophie? 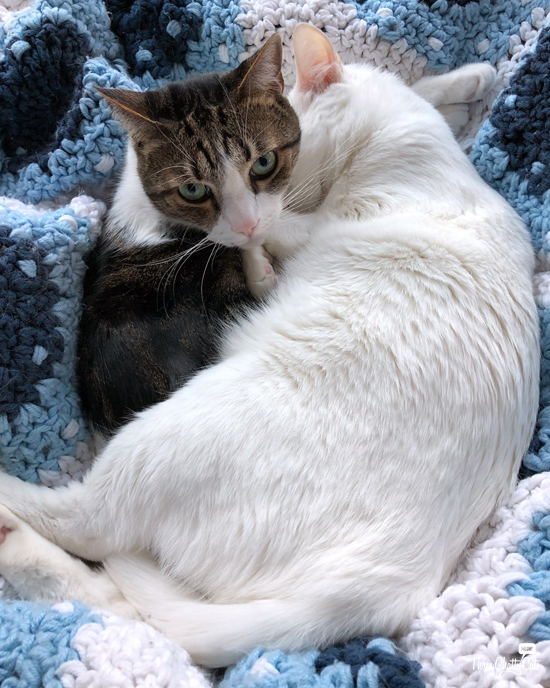 We hope all our kitty (and human) friends stay warm this weekend! OMG, your kitties are so adorable! Love your conversations! Y’all look ready for the weekend and maybe that shadow can get in on some snuggle cuddle time too! 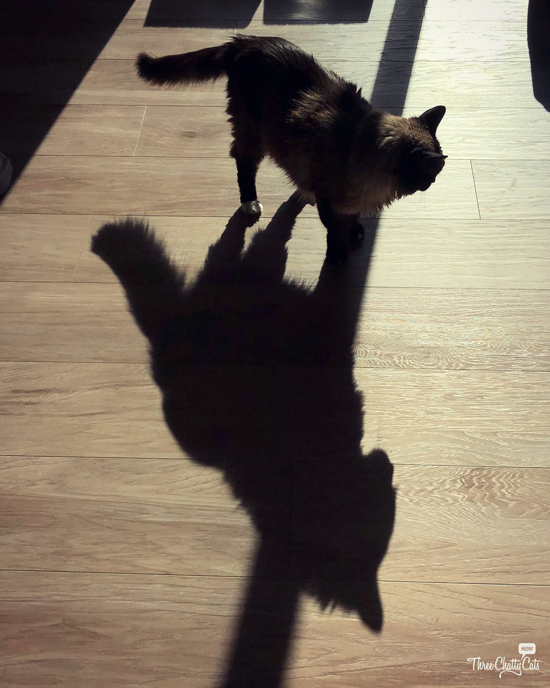 Love the big shadow cat photo and the whisker photo especially today! yor boi cat r so hamsum…….. 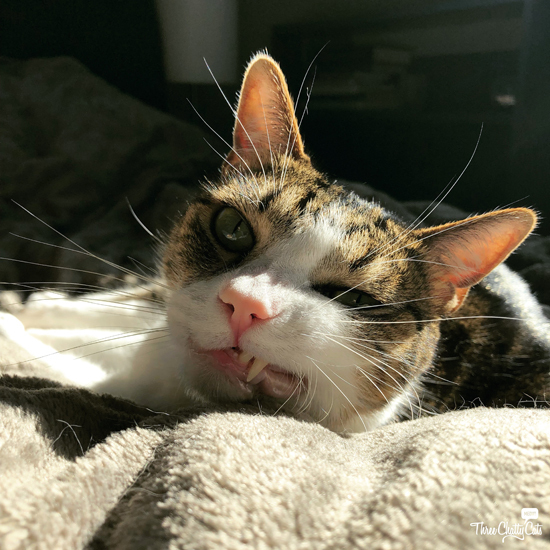 I love your smile, Dexter! I don’t get any of the channels showing kitty, puppy, or dog bowls. I’ll probably watch a movie while, like you, hearing shouts throughout the neighborhood. If the Rams win, I’m sure there will also be illegal fireworks and mortar rounds (courtesy of the jerk on the next block). Our peeps will be watching the big Bowl game…just because. But we much prefer the Kitten Bowl. I would’ve guessed Sophie too! Not because of how your paws look, Woodrow – but because all we see is white! And you’ve got all kinds of amazing stripes! We loved your chats this week! You guys are always so cute. Would love to watch the kitty bowl but it’s on to late for my family to watch. Woodrow! We totally guessed that they were your mancatly paws! You guys are all so cute! And what are we doing today? As soon as we finish commenting, Mom will lay on the sofa reading a book and I will lay on top of her and the stupor bowl may (or may not) play in the background. 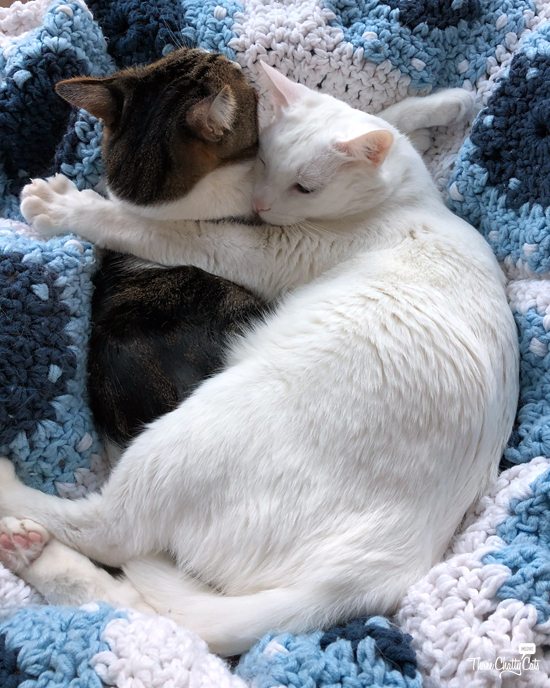 the photo of the cat cuddles melted my heart!! Just like Frodo and Zulu!